There is nothing more annoying when you're trying to buckle in a struggling two-year-old into their car seat than having the door constantly whack you from behind, pushing you into the car on top of your kid. Even if I opened the door slowly and carefully let it go, it just wouldn't stay open. I had to open up the door panel to replace the door lock actuator anyway, so while I had it open I figured I'd take a stab at fixing the part that is supposed to keep the door open: something they call the door checker. Sure, this is a relatively cheap part, but if all four are causing you grief, it would likely run you over $100 to replace them all. I'll be doing this on one of the back doors of my 2003 Honda Civic. The door checker on other cars may be similar though. If you have similar success on another car, let me know in the comments. First thing, make sure you've removed the door panel. Once that's done, remove the three bolts holding the door checker in place. If your Civic was built in Canada, the bolt sizes may be the same as mine: 10mm for the bolts on the door and 12mm for the bolt on the car frame. The door checker can only be pulled out through the inside of the door. So reach inside the door with one hand and pull it out. So let's open that bad boy up. Slide the big part (the part that slides) over to the slim side of the bar so it's easier to work with. There's a plate with little tabs on each corner holding this thing together. Fold those tabs up with pliers. In the picture, the tabs on the right are already folded up. The slick clip-art pliers show how to grab the pliers on to the tabs to pull them up. You can use a flat-head screwdriver too, but that's dangerous; trust me. They can slip off easily and stab you in the hand. Not fun. Once you've got it opened, pop out the insides. This is what you'll see: two plastic H-shaped pieces with two rubber blocks that put pressure on them. Now those two plastic pieces are supposed to have a bump on the inside of them to fit into the grooves on the bar, but as you'll likely notice, they're flat now. However the plastic pieces are small enough to fit into the grooves themselves. But because of the H-shape, the two pieces can't get any closer to each other. So sand them down. 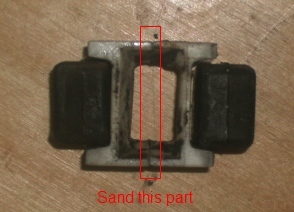 The picture shows which part to sand. You don't have to worry about sanding too much since you really don't want those parts touching anymore. The picture to the right will show how the pieces fit over one of the grooves after I sanded them down. Now because we're pushing them closer together than they were before, the rubber blocks will be too small. So we need to put something else in there. I used cardboard. I cut small pieces, about the same size as the blocks. Depending on the thickness of the cardboard, you'll need to use one or two pieces on each side. I won't lie to you: stuffing the plastic, rubber and cardboard back into the thing is the hardest part. If you're finding it hard, that means you're doing it right; it needs to be tight! A flat-head screw driver came in handy for me. Keep the casing down near the narrow end of the bar to make it easier to shove everything in. Once you have everything in, put the plate back over top, but don't fold the tabs over yet. Slide it back and forth across the bar first, holding the plate firmly over the rubber and plastic so they don't fall out. You should find it extremely difficult to move it past the grooves. In fact, it should either take all of your might to do it, or if you can't move it out of the groove at all, even better. I'm serious about it taking everything you have to move it. That's important. If that's not the case for you, shove some more cardboard in there. Otherwise it'll still be too loose once you put it back on the door. 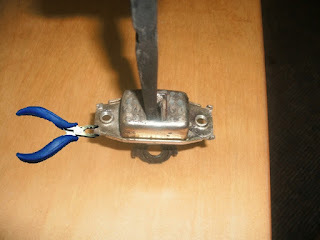 Once the tension is acceptable, fold the tabs back into place with pliers again. Now you're ready to go! 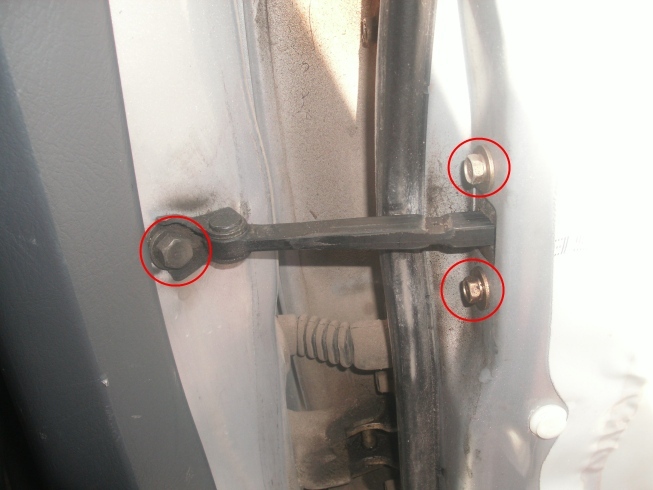 Put it back in place through the inside of the door, replace the bolts, and open your door wide and watch it stay! You may want to grease up the bar again since I found that a lot of the grease came off after handling it so much. The grease will help the door slide shut when you push it shut. 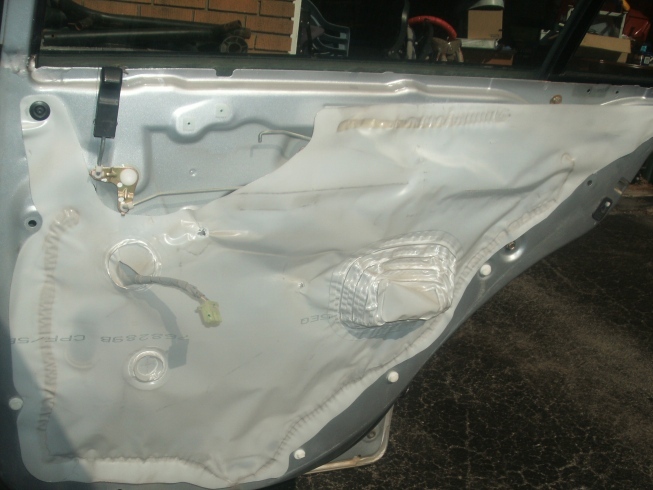 I needed to remove the rear door panel from my 2003 Honda Civic to repair the door checker (that's right, repair, not replace). I found there weren't many detailed instructions online on how to do this, so here goes. First, there are two pieces of plastic that just pop off. One is behind the door handle, the other is on the under side of the arm rest. Just shove a flat-head screwdriver into the notch in the plastic and pry them off. The arm rest is the toughest. It'll feel like you're going to break it, but it'll come off. Once you have those off, there will be four screws you need to take off: two behind the door handle, and two deep inside the arm rest. 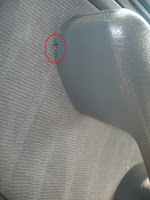 There are two other ones on the arm rest that do not need to come off. Well, you could take those off if you want to make more work for yourself. But you really don't need to. 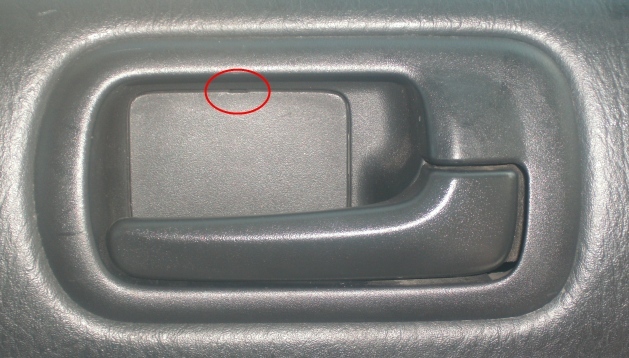 Before you go on to take the panel off, take off the door handle so it's not in the way. It's held on to a metal rod by a little plastic clip. 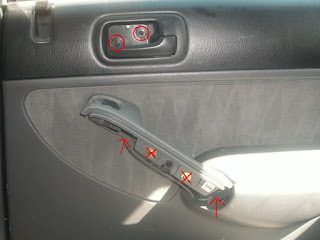 Pop that off the rod by rotating it toward the outside of the car, like in the picture. Then you can slide the handle down and off the rod. Now you can remove the panel, but not so easily. It's still held in by plastic clips every few inches around the sides and bottom. You can carefully use a flat-head screwdriver and pop those up as you go around. Or apparently, there's a tool made just for this. I didn't use either method. I just yanked really hard, starting on the hinged side of the door, where I could more easily get my hands behind the panel. If you try this, don't blame me if you break anything. I didn't, but that doesn't mean you won't. 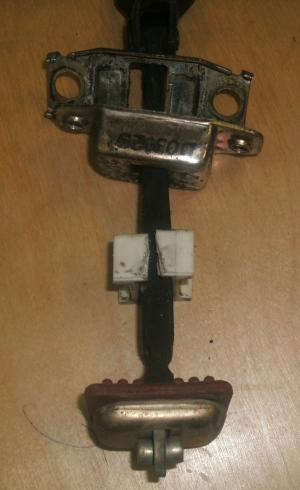 Once you get the sides and bottom free, the top will need to slide up and over the lock. And once that's loose, you'll find the wire for the window still hanging on. Just squeeze that and pull it off and the whole door panel will be free. 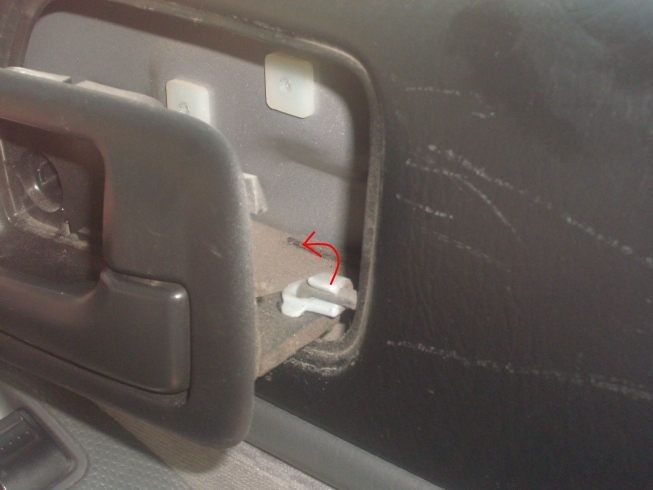 I found that some of the white plastic clips stayed in the door after I pulled the panel off. You can see them in the picture. If that happens to you, pull them out by hand and slide them in the spots on the panel where they came out of. They'll need to be there when you put the panel back on. And voila! The panel is off. Now you can go on to do whatever you needed to like, say, fix the door checker.